I’m excited- Hunter Hammersen’s new book Silk Road Socks is now available. Not only, can you purchase the book in the standard paper format but its also be offered in a digital form. I think that’s so cool – so for those who like to have eveything at the ready on their laptops or e-readers there it is! In addition, for those who want to curl up on the couch with good old paper you can have that too! Either way the photos are stunning and I love the historical information about the Silk Road and the amazing carpets. Hunter’s patterns are, as always, are easy to follow and the socks are fabulous. Ok, you can see I love this book, I love socks, I love sock yarn! to receive 20% off Sock Plus 8 from now until Feb 15, 2011. Happy Sock Knitting to All! Handwerks Classic Dk was recently featured in the Fall 2010 issue of Twist Collective (http://twistcollective.com/2010/fall/magazinepage_049.php). Designer Faina Goberstein used Handwerks Classic Dk in Tropical Seas in her gorgeous Crown of Leaves hat. The new”Knitting Knee-Highs: Sock Styles from Classic to Contemporary”, by Barb Brown, from Krause Publications is now available for pre-orders on Amazon.com. Brown’s book features several Handwerks yarns in sure to be favorite sock patterns. Sock Plus 8, formerly “Sport Sock” is coming in new larger 400 yard/120 gram skeins, the perfect size for one pair of socks. With the new larger skeins, will be a newly expanded color line. Silky Sock is on its way to being a favorite staple for many Handwerks customers. 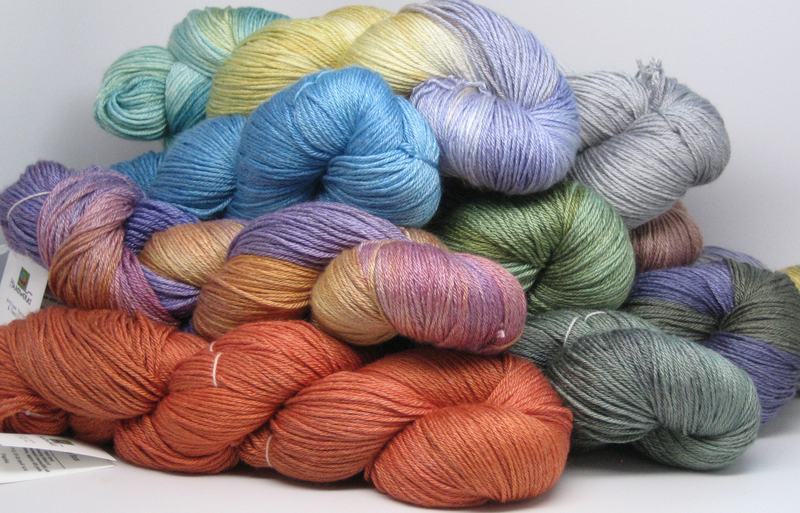 New colors in this versatile 50/50 silk/merino yarn will be coming this fall. Handwerks is available for Trunk Shows and Custom Orders. Barb Brown’s new book Knitting Knee- Highs: Sock Styles from Classic to Contemporary is now available for pre-order on Amazon.com. It includes several patterns: Omar’s Carpet Kneehighs, Calf length socks and Nice socks in custom dyed colors from Handwerks. Here is the link. I can’t wait to get my copy. I always love seeing Handwerks yarns knit up and Barb’s designs are gorgeous!